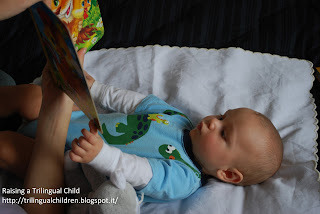 Google+ Raising a Trilingual Child: Bilingual child: when to start reading to your baby? 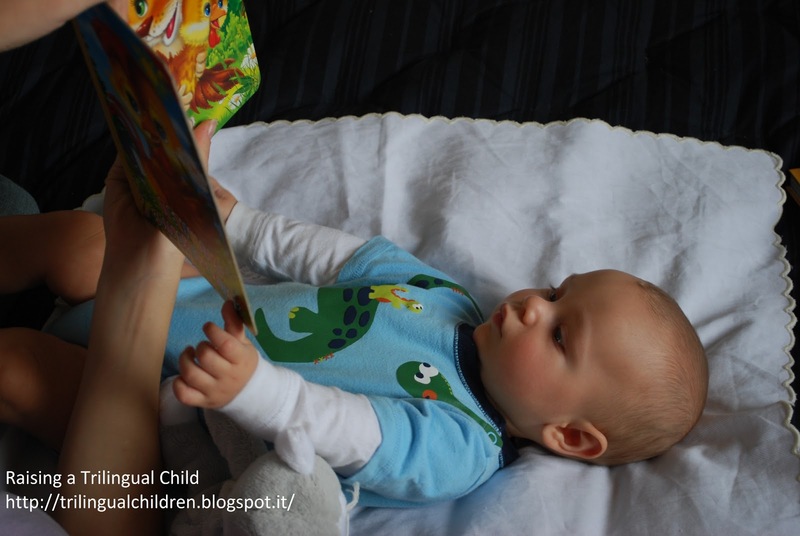 Bilingual child: when to start reading to your baby? My kids learn how to read words, when they were about 3 years old. When parents ask me when I started reading aloud to them and seek an advice on when they should start reading to their own child, I answer - as early as possible and before your baby learns to roll over. Do you know why? The moment a child rolls over the world becomes so big for him, that a book, no matter how colorful it is, would be just one of the hundreds of objects he briefly looks at. I could see this happening with my young daughter. I missed that period and had to wait about 4-5 month until she was ready for serious reading. If your child learns how great the books are before exploring the world on the tummy, you will have his attention while reading also during those exiting discovery times. Reading during those month will allow him to build a richer vocabulary and create a solid base for correct speaking. I started reading to my first child when he was 4 month old. However, I did it not for him but for myself. Since I mostly spoke foreign languages I had difficulties starting speaking the minority language - Russian - to him. Try it ! Reading is so much fun and the results are amazing! According to Dr. John Hutton of Cincinnati Children’s Hospital Medical Center , "... reading exposure during the critical stage of development prior to kindergarten seems to have a meaningful, measurable impact on how a child's brain processes stories and may help predict reading success." Researches found increased activity in the areas of the brain that are essential to verbal language development and reading, and to imagery. Thus, confirming once more the already existing theories on importance of visualization in understanding stories and developing reading skills. Does it make any sense to you? Would you start reading to your child earlier? and if you did, what do you think about it? How to read to a child? Advice for parents of monolingual, bilingual or multilingual children. 9 Steps of Raising a Bilingual Child Successfully. How to Start So You Don't Feel Giving It Up Halfway Through. How much time do we have to influence a child's minority language development? Naming languages with their proper name. 7 principles to keep in mind while teaching your child to read. My kids loved books. It is so cute when they read the books out loud from the memory before they can read :) ! Never miss a new post!- Subscribe today for tips and updates! FREE Audio Books and Stories for children in English. 19 great websites. Pros and Cons of Raising a Trilingual Child. Raising a Trilingual Child: How NOT to do it. Does passive language learning work? What language should I speak to my child in public? - Multilingual parent dilemma. 7 facts that can determine the language spoken between multilingual siblings. © Trilingual children, Raising a Trilingual Child, 2013-2016. Unauthorized use and/or duplication of this material without express a written permission from this website authors and/or owner is strictly prohibited. Excerpts and links may be used, provided that full and clear credit is given to Galina Nikitina and Raising a Trilingual Child with appropriate and specific direction to the original content ( the link to this website must be provided).